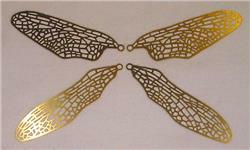 Dragonfly wing filigree in two sizes, for use in lampshades, suncatchers, or your very own creations. Also poppy filigree especially for Tiffany style lampshades. How to work with brass filigree: In order for the filigree to match the rest of your stained glass piece, you will need to tin it beforehand. Place the filigree on a heat resistant surface (a piece of wood is OK). Rub it with very fine steel wool to help the solder adhere to the filigree. The filigree will get extremely hot while you are tinning it, so wear protective gloves. Coat one side of the filigree with flux, then tin it with the thinnest possible coating of solder. Flip it over and tin the other side. Apply patina. Your filigree is now ready to be soldered to your lampshade or other project. Exclusive! Small and delicate dragonfly wing filigree for stained glass lampshades, suncatchers, or whatever suits your fancy. Made of bright sheet brass. 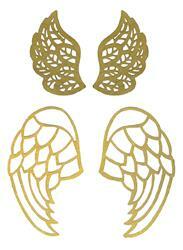 One set consists of 4 wings. Total wingspan is about 9 inches. Made of sheet brass. A set consists of 24 pieces. For Whittemore-Durgin's #6324 18" cone Poppy lampshade, order one set. Also designed for Worden System SC20-3 Poppy lampshade. These brass angel wings, small or large, are just the thing to turn any humdrum character into a cherub or seraph (respectively).